Now that my cards have been sent out awhile ago, I can finally post what I did for this year's design, hopefully without ruining the surprise for the recipients. 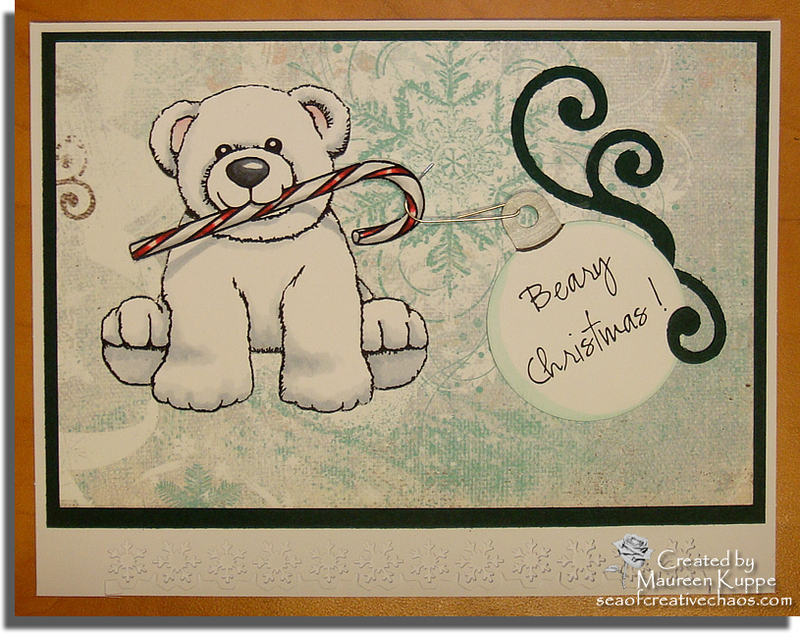 First, I knew I wanted to use my own drawing of CranBeary bear (one of my digistamps over at my DigiDrawn site) as the focal image. 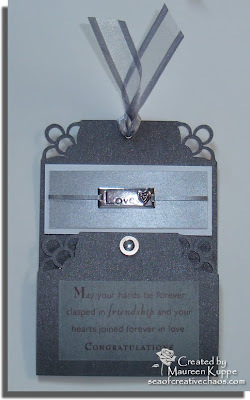 Next I found my Sizzix Round Tag die and ran it through my Cuttlebug. When I looked at it closer, I realized it bore a good resemblance to a Christmas ornament, so I coloured it in that way, attached a real ornament hanger and hooked it over CranBeary's candy cane. 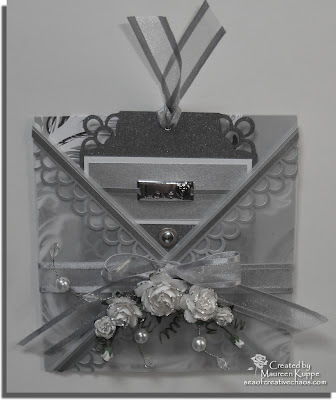 The paper used for the snowflake background is "Christmas Magic - Silver Snow" by Fancy Pants Design. A Martha Stewart snowflake punch was run along the bottom of the cardfront, and another Sizzix Scribbles Swirls die was used to punch out the green swirls, matching the cardstock for the background mat. 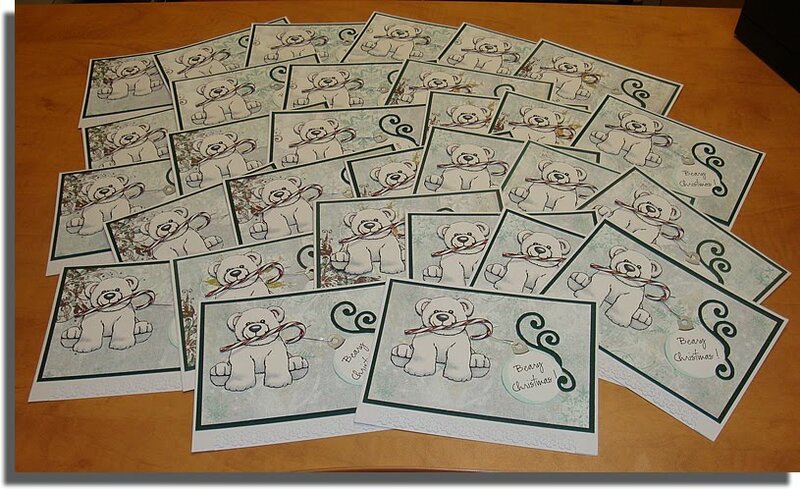 The longest part of the process was colouring in over 30 CranBearys in Copic markers and cutting them all out! At least this year, I smartly chose an image that is mostly white! Oh my! I have been negligent around here, haven't I? 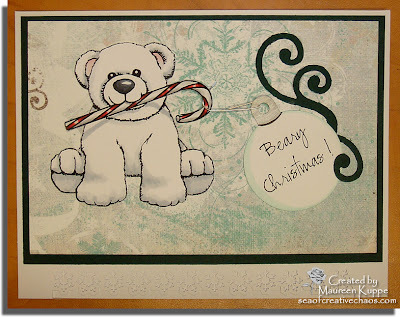 It's not that I haven't been busy; between travelling to Dallas and then Minneapolis, creating images for my DigiDrawn stamps site and getting ready for Christmas (I am so NOT prepared!) I haven't posted any of my creations since October! 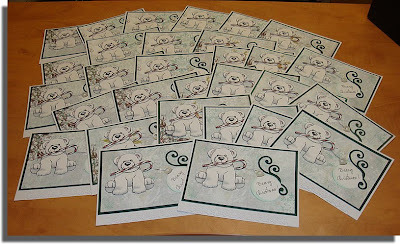 Now I really MUST finish my Christmas cards!!! Yikes indeed! My parents will be celebrating their 62nd! Anniversary this weekend. Here's a card I made and have already given them, using another sweet Maggie! I inked up Tilda with Vintage Roses for the very first time, since my Mom really loves Magnolias too and I used my Dad's favorite colour, teal to colour her in. I LOVE this TPC Studio Ancestral Teal Brocade paper and used matching Bazzil cardstock for three mats which were layered and popped up on foam dimensionals. I used Chalk Ink to finish off the edges of the papers, including the scallop-cut and embossed image using my Spellbinders die. Wild Orchid Crafts roses were left neutral, and so I matched Tilda's roses to those too. I only had a silver heart charm, so I spray painted it gold and tied it to some sheer ribbon. I really love the simple yet elegant way this turned out. They did too! I coloured my new digistamp with Copics: N3, N4, N5, N6 and N9. The neutral greys give a greater ability to shade than simply colouring this bat in with flat black. The other colours used on it were R30, R32, R35, Y32, Y35 and Y38. The paper and ribbon is from my stash. 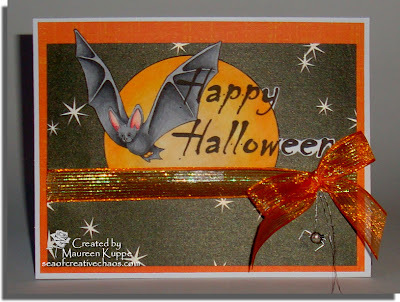 I thought the card needed some bling, so I looked and looked and to my disappointment, I couldn't find any Halloween charms around. So I had two choices: either hop in the car and head out to Michael's to see what they had, or to make my own. If you'd like this image for your own spooky cards, you can find him over at my DigiDrawn stamp site! I've been longing for the cooler days and nights of autumn... my favorite time of the year can't come soon enough! "Patch Tilda" is now "Pumpkin Patch Tilda"! I drew the six pumpkins, coloured them with Copics and popped them up on foam dimensionals, adding Tilda with ScorTape so she is safely resting on one of the large gourds. 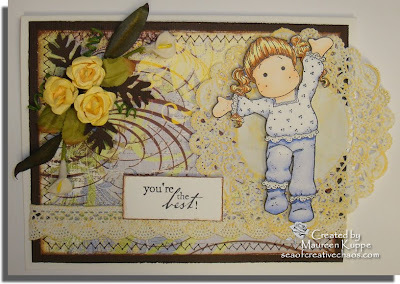 I used Bazzil cardstock for the base and on top of that layered some Fancy Pants "My Family - Aunt" paper, inked with Stampin' Up's Mellow Moss and distressed with my Making Memories distress tool. 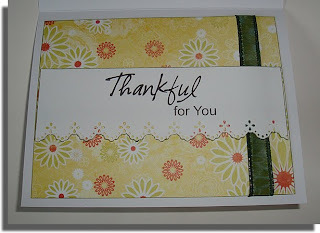 Before I distressed the patterned paper, I ran it through my printer to add the sentiment. A simple addition of green wired sheer ribbon, with a double bow to finish it off. The inside of the card was the same patterned paper, just the second side... the sentiment was cut with my Martha Stewart lace border punch and edged with the same Mellow Moss ink. If you'd like a pumpkin patch of your very own, check out my DigiDrawn site for the stamp! Or, if six pumpkins are too much for your needs, choose from two other versions: I've also drawn a set of three pumpkins, and an image of a single pumpkin with leaf! Whew! 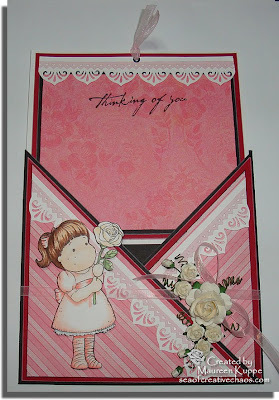 I took advantage of this long weekend to catch up on my cardmaking... since I have been busy drawing digital images, I haven't had time (until now) to actually MAKE some cards with some of my new stamps! Using some Karen Foster patterned paper, I simply sewed a zig-zag stitch in black thread around the edge, mounted it on black cardstock and added two pieces of brown ribbon from my stash. Tilda is also popped up on foam dimensionals for added interest. The second card is another Tilda; this time I placed "Lazy Summer Day Tilda" atop my new Cupcake stamp. The background is simply layered cardstock, edged with Memento Tuxedo Black ink to match the stamps. 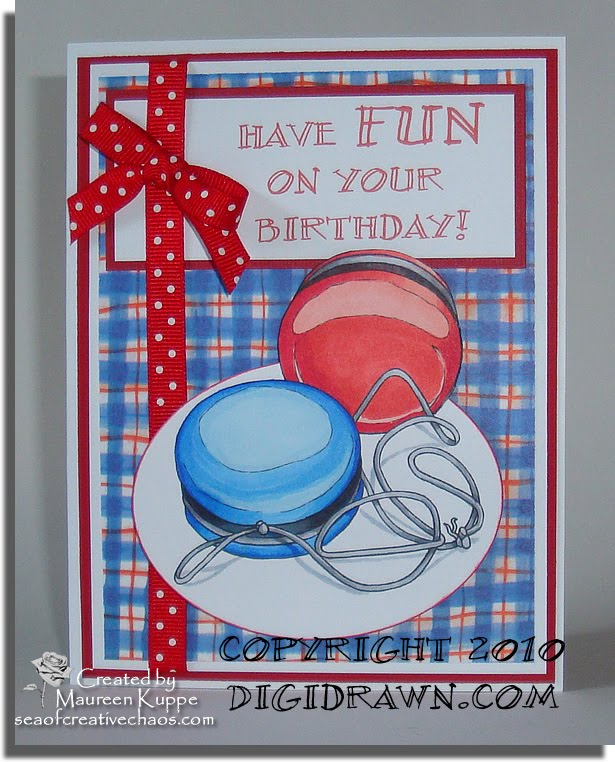 I used Cuttlebug's Happy Birthday embossing folder for the blue layer. 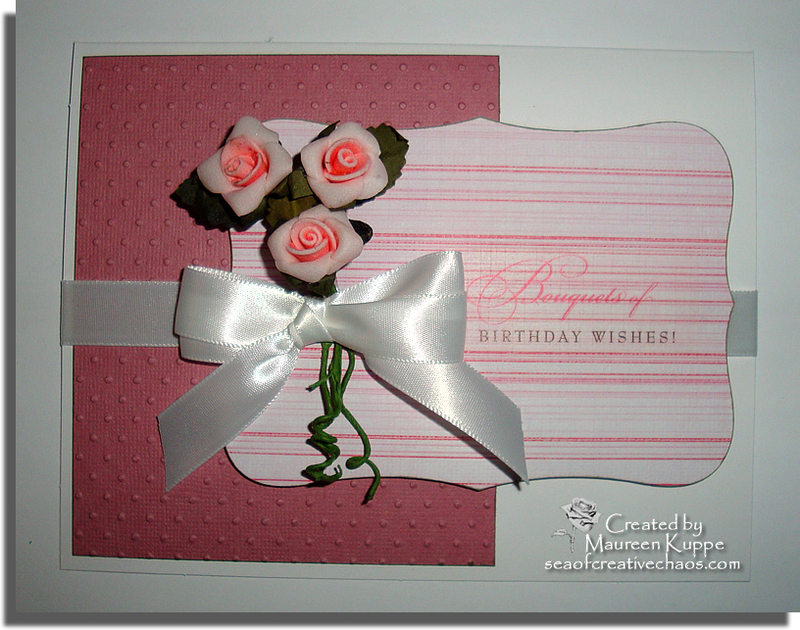 Ribbon from my stash and three rosebuds from Wild Orchid Crafts were tucked behind a bow made with my Bow Easy tool. Again, I used Karen Foster paper, ribbon from my stash, and the sentiment was computer generated. 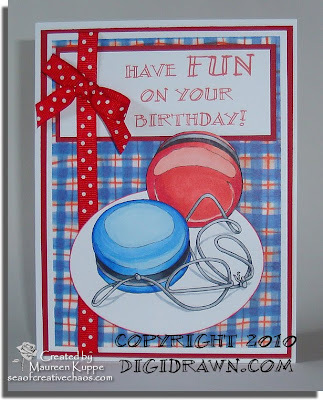 The image was cut out using the Out of Bounds technique with an oval Spellbinders die. If you would like to use any of my original hand drawn images for your own cards, you can purchase them over at my DigiDrawn site HERE! The background paper is Basic Grey June Bug Crazy Quilt. 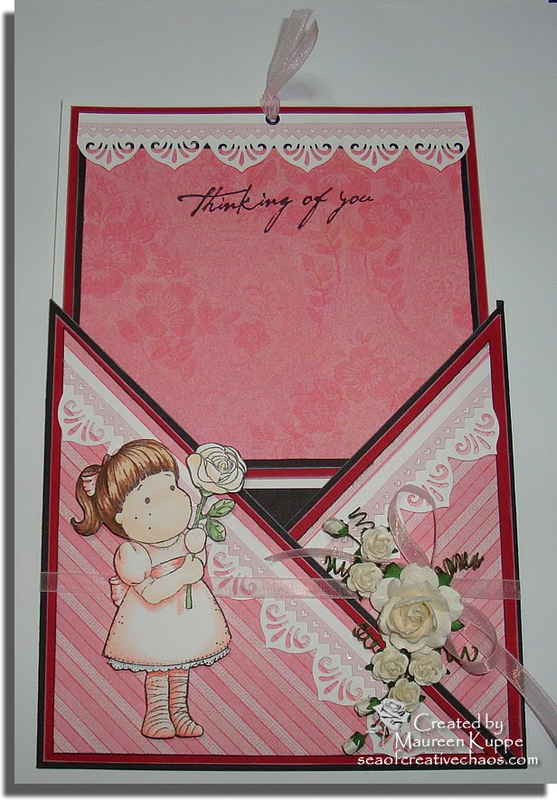 The edges of all the papers are inked with Stampin' Up's Perfect Plum. Three Wild Orchid Crafts cherry blossoms and a Martha Stewart Oak Leaf punch were added next to the Scrappy Cat Birthday Wishes sentiment, also popped up on foam. 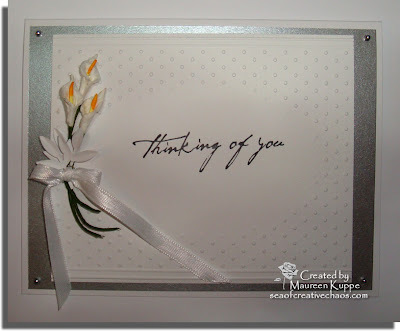 I used a Spellbinders die to cut out the sentiment and another Martha Stewart punch (Double Loops) for the bottom of the card. The ribbon wrapped around that is Michael's Celebrations brand. 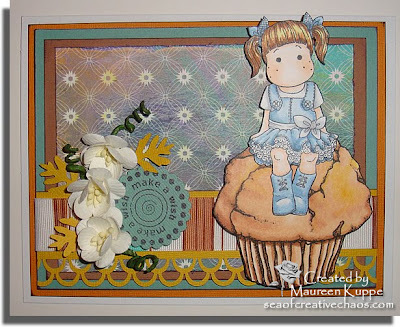 If you'd like to use this yummy muffin stamp for your own projects, you can purchase it over at my DigiDrawn site! I noticed over at the Copic Creations Challenge blog that the current challenge is for a card with a bird theme. 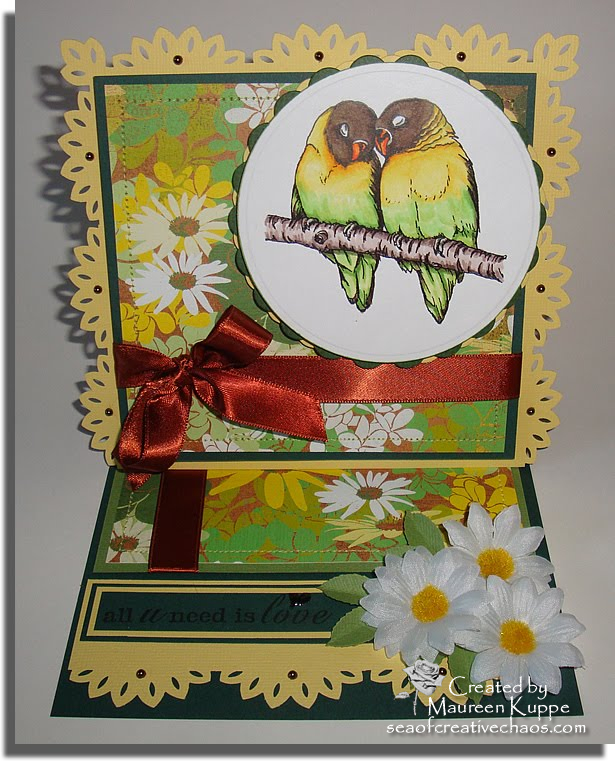 Since I hadn't made a card yet for my Lovebirds digistamp, I decided to create one and enter it into the challenge. 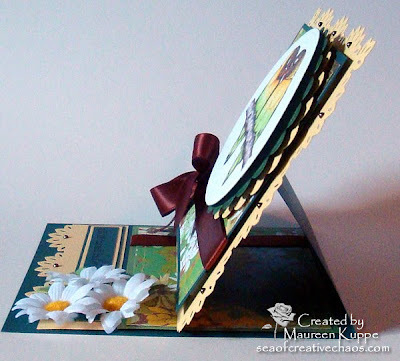 This easel card was made from numerous layers of green and yellow cardstock and Basic Grey's Origins Aromatherapy paper. 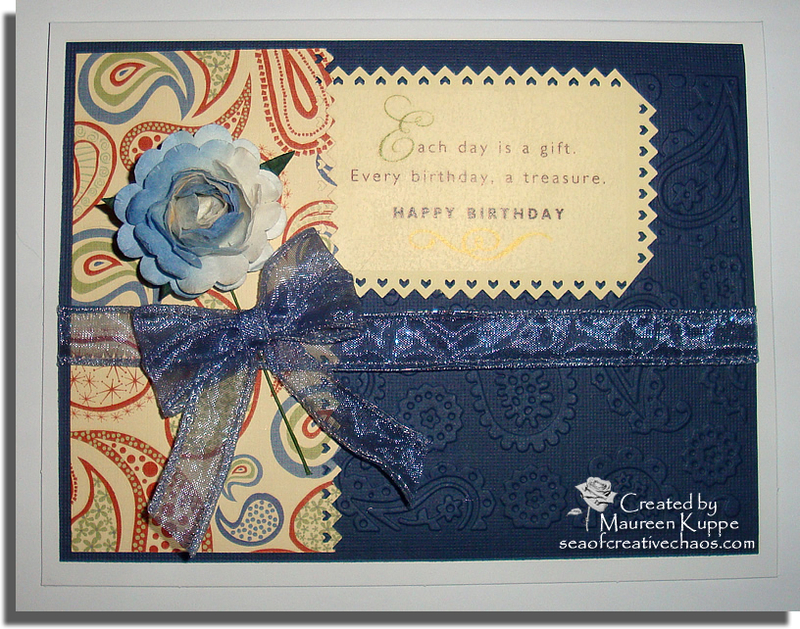 I used my sewing machine to sew the patterned paper to a cardstock mat on both the front and inside of the card. 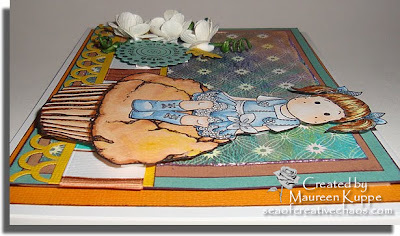 The image and it's mats were cut out using Spellbinders dies and my Cuttlebug. 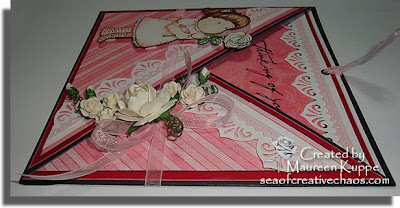 The background cardstock was punched with a Martha Stewart punch and decorated with Recollections brown pearls. 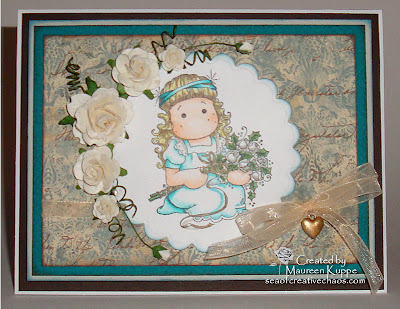 The ribbon is by Celebrations from Michaels and the daisies were purchased loose from my LSS. Another Martha Stewart punch was used for the leaves. If you want this digistamp, head over to my DigiDrawn site to purchase it HERE! While doodling the other day, I ended up drawing this little guy. At first I thought I would make him small with stitching lines so he could be a stuffed toy for a Tilda stamp. But I ended up creating the digistamp of him without the lines, about 4 inches square. This way, if I want to make him into a stuffie, all I need to do is add some lines and print him smaller, which is one of the benefits of digital stamps; you can change the size and orientation of the image! The card I made for Baby Fox (I have yet to name him -- any suggestions???) has five layers (including the card base), popped up on foam dimensionals. I started with Bazzil cardstock punched with Martha Stewart's Deco Fan set. 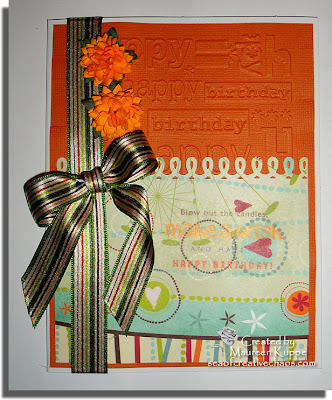 The next layer is patterned paper (I am sorry, I no longer have the name of it!) matted on more Bazzil. 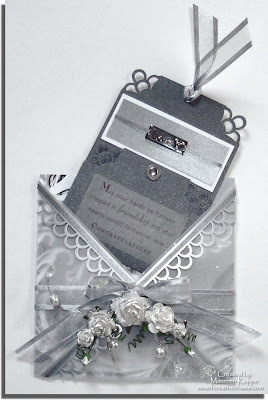 Both are edged with ink; Memento Tuxedo Black and Versa Magic Cloud White. 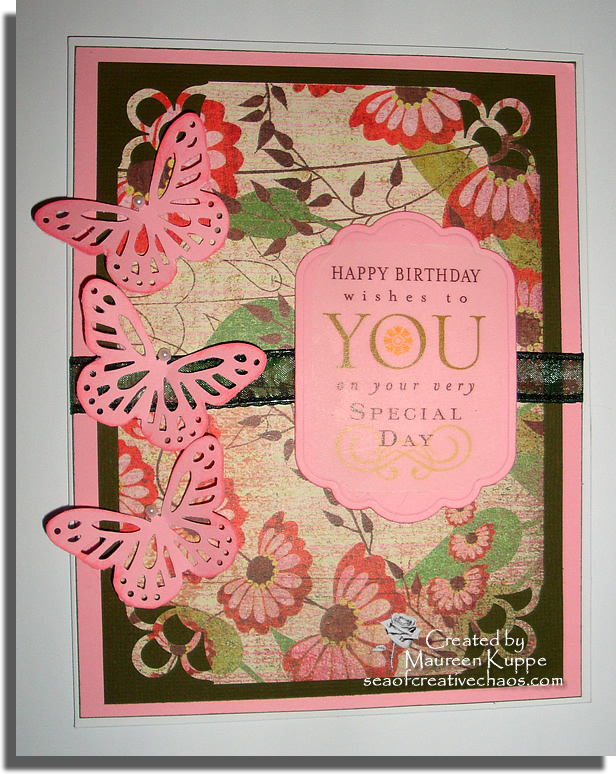 The next layer set are two ovals cut out and embossed with my Spellbinders dies using my Cuttlebug. Again, they were inked in black and white. 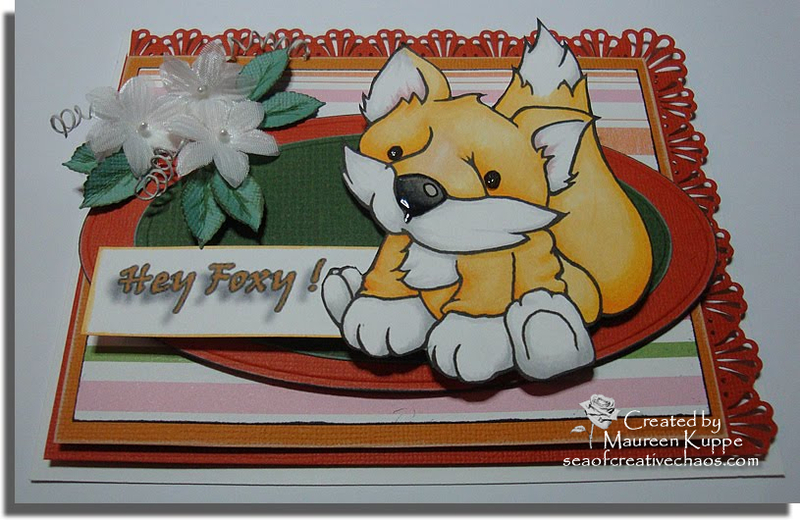 The top layer is the Baby Fox and sentiment both popped up on foam too. 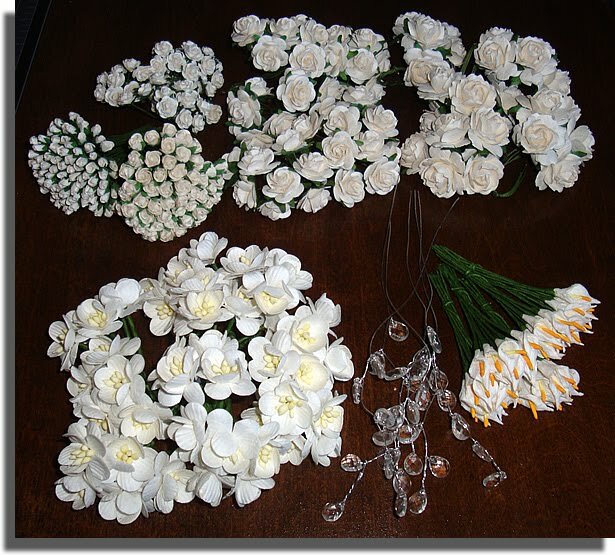 Flowers are from Michael's Bridal Department (loose), and the leaves were made with Martha Stewart's leaf punch. 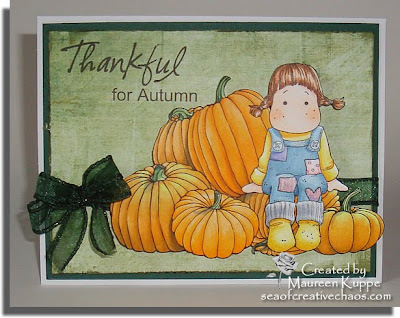 The leaves were inked with Stampin' Up's Mellow Moss ink and the veins were drawn with Copic G85. 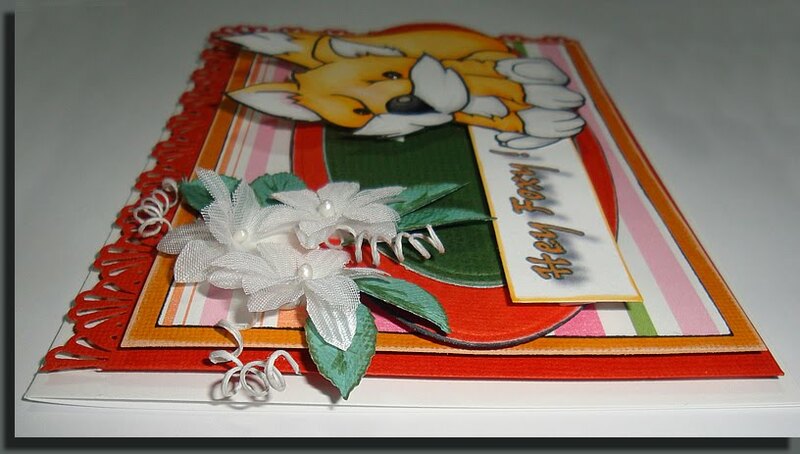 The fox was printed on my Epson inkjet -- no problem at all with bleeding when I coloured with my Copics! His eyes and nose were topped off with All Night Media's Clear Gloss. 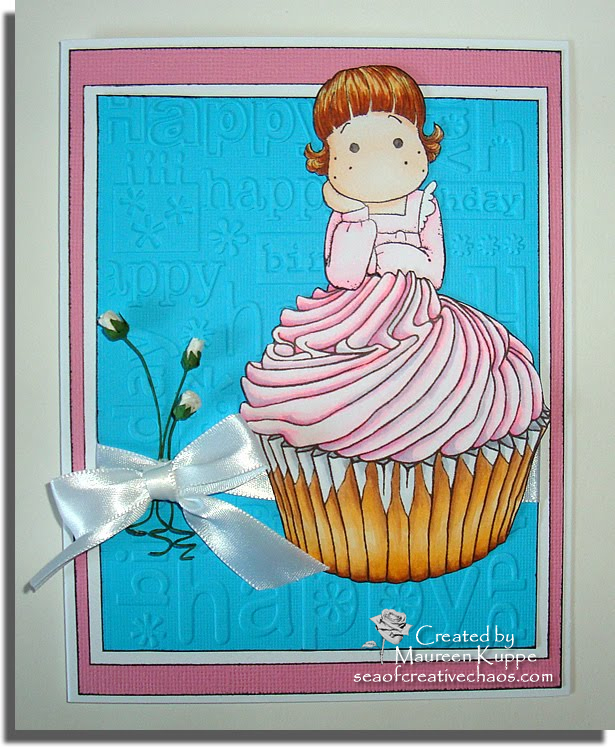 The sentiment is computer generated, and the inside of the card is stamped "It's Your Birthday!" Do you want this little guy for your very own? Then check out my DigiDrawn site to purchase this digistamp for only $ 3 CDN! Do you want this little guy for FREE?? Then add your suggested name for him in the Comments. 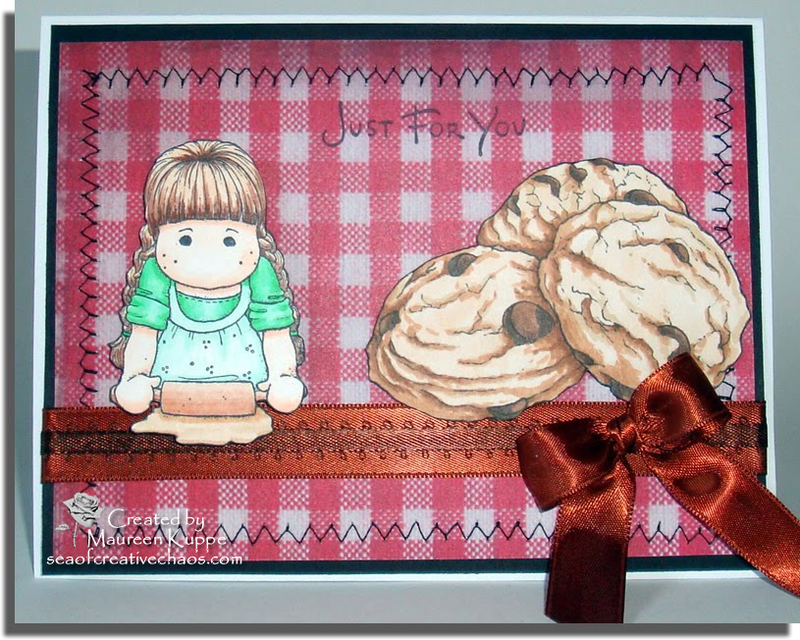 If I choose yours, I will send you this digistamp absolutely free! 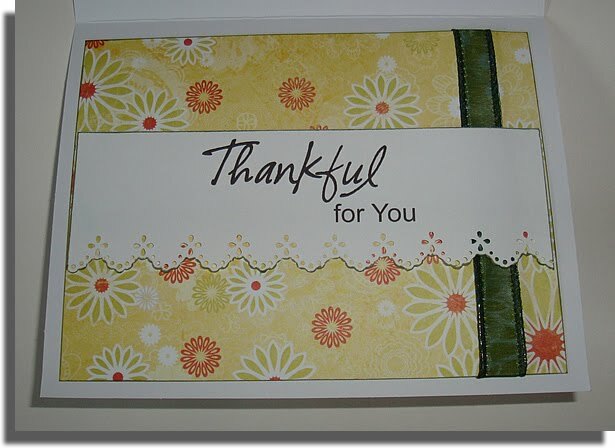 When crafters praise the products and service from a certain company over and over again, you tend to take notice. Once such company is Wild Orchid Crafts. 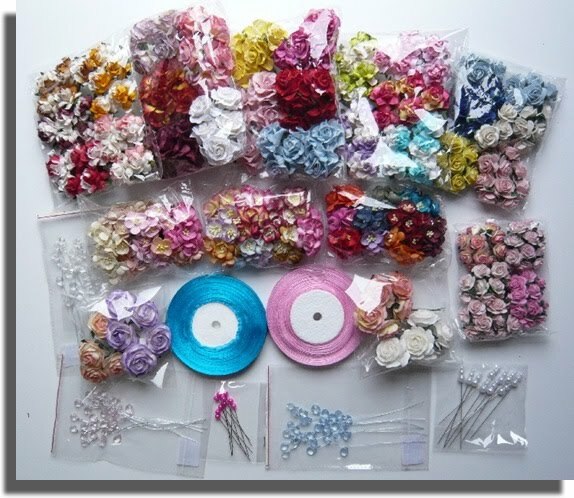 The paper flowers they manufacture are absolutely stunning and they are showing up on numerous card crafter's blogs from all over the world. Just the other day I placed my very first order. Since I wasn's sure which sizes to get, I chose a variety from 4mm to 25mm all in white (save for one which was sold out of the white, so I got ivory). Why all in white? Well, now I can use my Copics to create ANY COLOUR I wish! Besides five sets of Roses, I also chose some Cherry Blossoms and Cala Lillies. I also couldn't resist trying out a few clear crystals too. To my amazement, the shipping was cheap, and FAST! It took just over two weeks to arrive all the way from the U.K. to Canada. 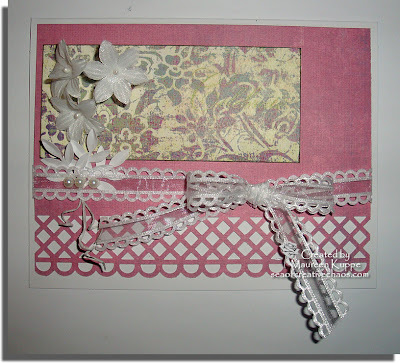 I am also entering this criss-cross card (my first one!) 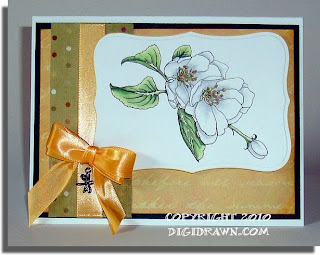 into the Just Magnolia challenge. Patterned paper: GCD Studios "Tinted Rose Stripe" and K & Company "Smitten Pretties"
I don't think I've used this "Lazy Summer Days Tilda" stamp yet.... with those pretty wings, she reminded me of a fairy so I thought I'd draw a nice mushroom for her to ponder upon. The patterned paper used is TPC Studio Ancestral Teal Brocade. 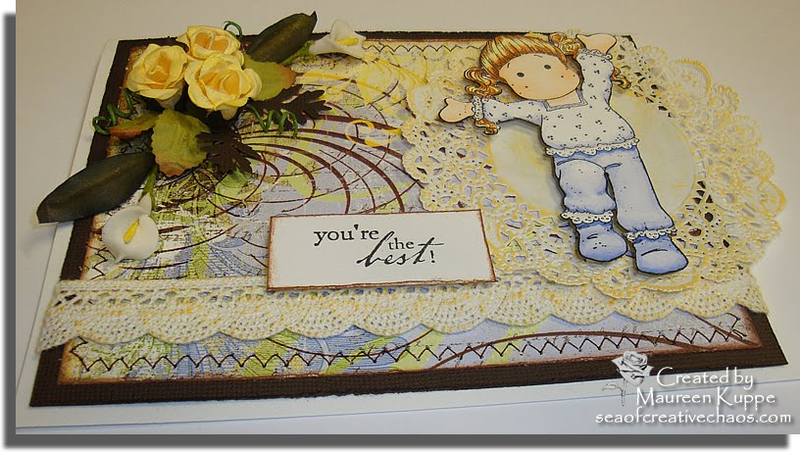 I inked the edges of all the papers with Tim Holtz's Walnut Stain Distress ink and used my Making Memories distress tool to rough up the edges before sewing the patterned paper to the cardstock layer. 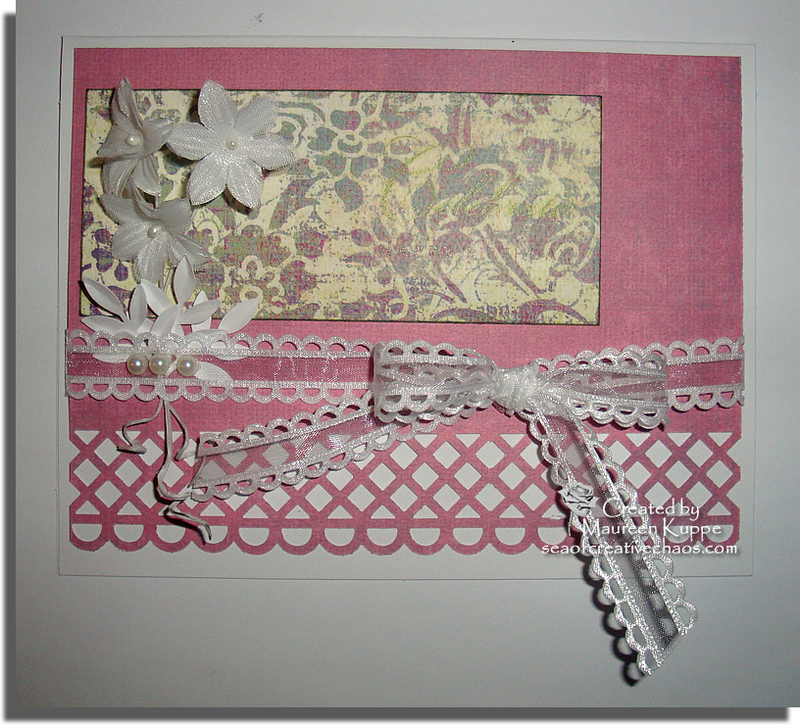 A Dollarama Crafts cotton lace ribbon was coloured with Copic # E50 and topped with a Dollarama Crafts flower and leaves. The mini butterflies were punched with a dollar bin Michael's punch and topped with Diamond stickles to match Tilda's wings. 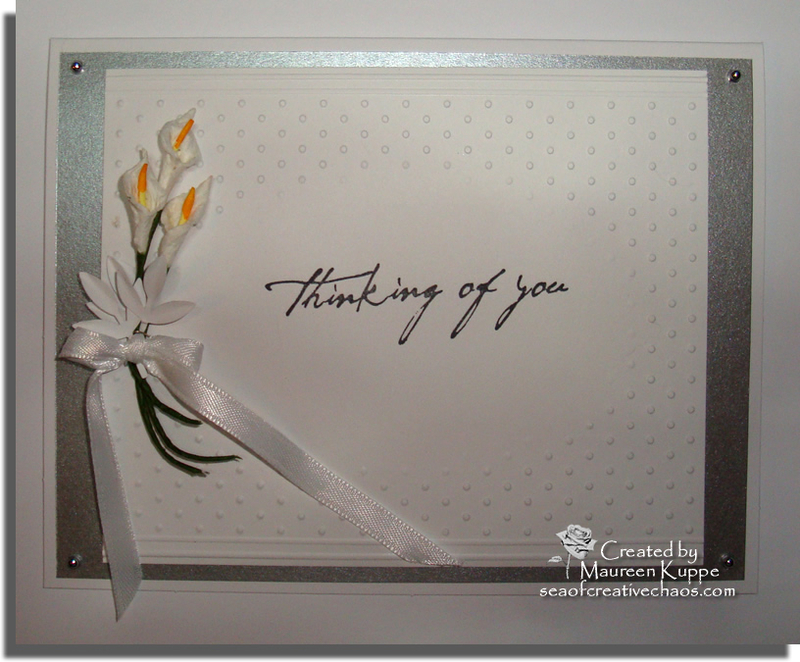 The sentiment is from Stampendous' "Friendly Messages" set. 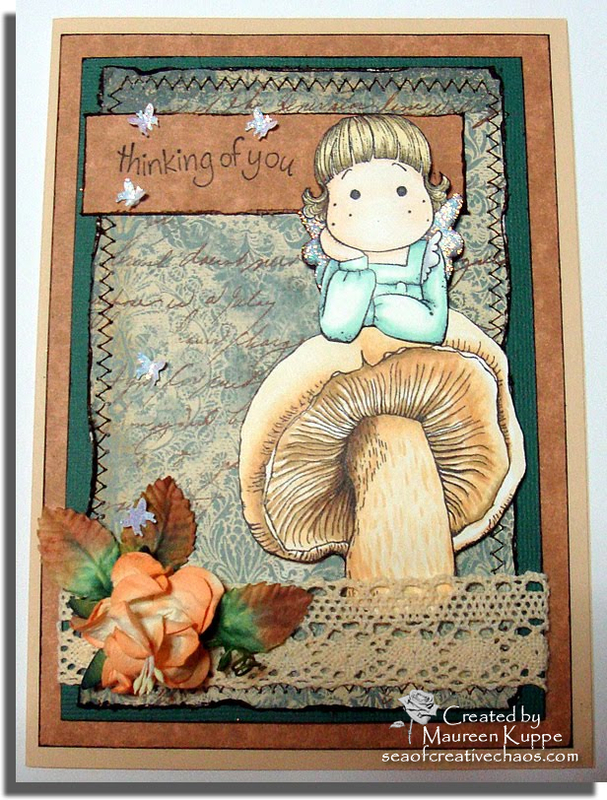 Here is a side view to show the dimension; I used Scor Tape to adhere all the layers and popped Tilda and the mushroom up on Recollections foam squares. Oh, and if you'd like this mushroom to complement your Tilda, fairy or even froggy stamp, you can! 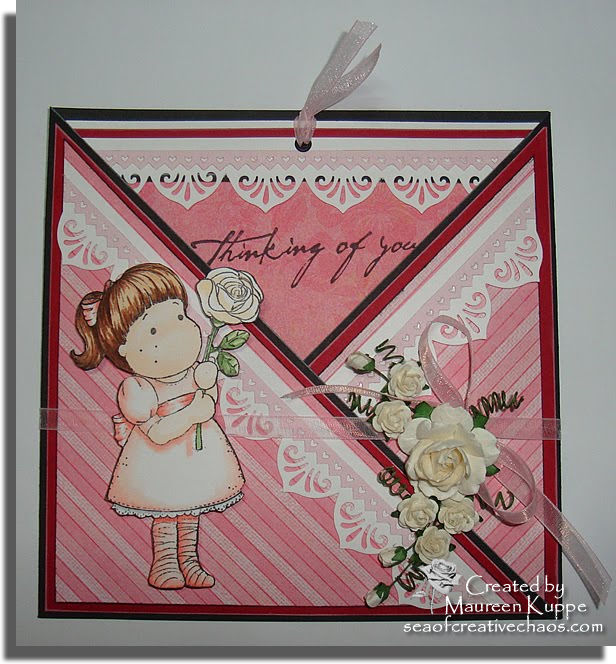 Just click HERE to purchase my digistamp for your very own cards.